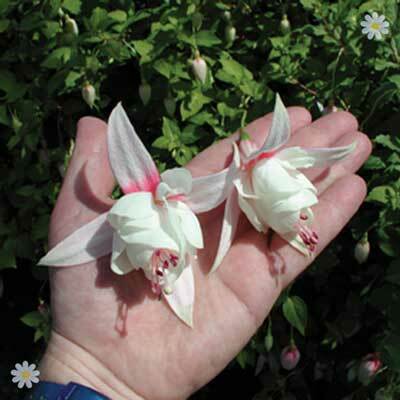 Trailing Fuchsia will cascade like a colourful waterfall over the side of hanging baskets and patio containers, complimenting the upright plants you place above them. The Ballerina-Like flowers look beautiful and the long, colourful trails, which extend to 45cm (18in) below the bottom of your basket, will add depth and most importantly real colour impact. These trailing beauties will also look perfect trailing over low walls or raised beds, but wherever you decide to plant yours, they will provide colour for up to 6 months from May until October. Each collection comprise 3 plugs of the following varieties: – Annabel – softest pure white, tinged with blush pink – La Campanella – berry purple, with contrasting white outer – Swingtime – huge ruffled white centres, surrounded by strawberry red – Jack Shahan – two subtle tones of rose pink The 4 varieties we have selected for you will give immense flower power, and whilst the flower size is slightly smaller than their Jumbo Flowered cousins, the total number of blooms more than makes up for the difference in size. They are perfect in mixed displays with other summer flowering plants, but also look simply stunning when grown as a mixture of fuchsia!